In a memorandum submitted to Union Textile minister, Smriti Irani in New Delhi, the association said though garment exports from China had been declining in a gradual manner since 2013, Chinese were ’silently’ entering countries like Bangladesh, Sri Lanka, Vietnam and of late Myanmar, by setting up manufacturing bases. China, by using advantages available to these countries with predominant EU and US markets, increased export and circumvented Indian industry’s growth prospects in the global market, which was a real threat to the industry here, TEA president Raja M Shanmugham said. "To face the onslaught of the Chinese, it was important for India to enter into FTA with EU, US, the UK and Russia, Comprehensive Economic Partnership Agreement with Australia and Comprehensive Economic Cooperation Agreement with Canada and other promising countries," he said. On the Tirupur cluster, Shanmugham said TEA had set a target for knitwear business, including exports and domestic, to touch Rs one lakh crore by 2020. The target was fixed by none other than Prime Minister Narendra Modi, which also subscribed to the minister’s (Smriti Irani) vision of doubling the textile industry turnover, he added. 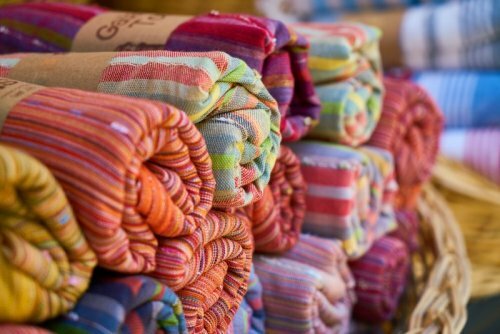 In the last financial year 2017-18, Tirupur knitwear business reached Rs 42,000 crore, of which the contribution of exports and domestic business were Rs 24,000 crore and Rs 18,000 crore respectively, Shanmugham said. Exports had declined from Rs 26,000 crore to Rs 24,000 crore, about 7.7 per cent, he said. This was because of unforeseen situations faced by industry, the TEA president said adding the bottomline was hit further due to implementation of GST and reduction of duty drawback by 5 per cent and ROSL by two per cent.